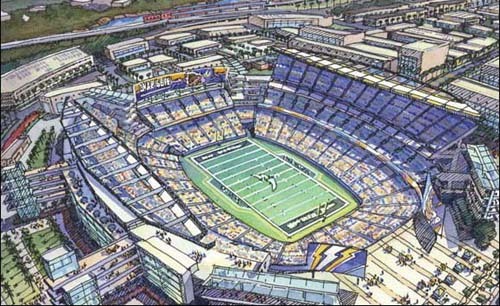 A New Stadium For SD? Not so fast! What’s up fellow Chargers fans?! 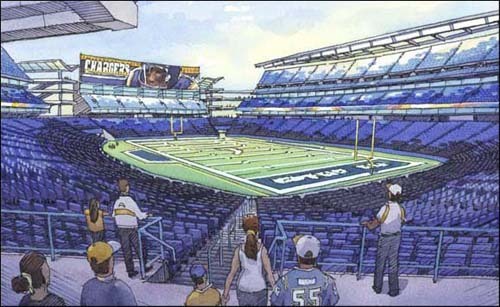 With the Chargers ranked third in the NFL, 2nd in the AFC, and the best season in a couple years, we are undoubtedly going to face the “New Stadium” debate very soon. While I absolutely want a new football stadium in America’s finest city, I must say that I am vehemently opposed to spending local tax dollars on the project. I have pasted some excerpts from a 35pg study on the subject to give you an idea of why and linked you to a summary of the analysis. From what I have found, this is consistent with reality as opposed to what the Chargers’ front man Mark Fabiani has been trying to sell SD. I respect Fabiani and the chargers very much, but private companies need to pay for their own house just like the rest of us… unless they want to cut us in on a bigger piece of the pie such as ownership. Unfortunately there is a Mt. Everest size pile of data on the subject and NONE of it is in favor of the local taxpayers. In summary, it ends with us footing the bill for increased city services, higher ticket prices(You didn’t seriously think your season or individual tickets would cost less did you? ), and “In general, the results of this study do not support a positive correlation between professional sports and job creation” (112). There now exists almost twenty years of research on the economic impact of professional sports franchises and facilities on the local economy. The results in this literature are strikingly consistent. No matter what cities or geographical areas are examined, no matter what estimators are used, no matter what model specifications are used, and no matter what variables are used, articles published in peer-reviewed economics journals contain almost no evidence that professional sports franchises and facilities have a measurable economic impact on the economy. Calls for subsidies at the local level come from interest groups and their consulting firms—which we call “promoters” of subsidization—who talk up local benefits of sports franchises, stadiums, and mega-events. As we shall see, promoters’ claims of such local benefits don’t hold up empirically. But such rationales can also be countered by simple economic intuition. The prospect of a game being broadcast nationally or even internationally from the stadium or arena is touted as a wonderful advertisement of the city’s virtues. These benefits, which the teams cannot capture, are used to justify a local government subsidy for the construction of the facility. THANKS TO – Dennis Coates (Professor of Economics at University of Maryland, Baltimore County and President-Elect of the North American Association of Sports Economists) provides a nice survey of the academic literature on the economic impact of sports stadiums in The American. REITERATION: I ABSOLUTELY WANT A NEW STADIUM! I LOVE THE CHARGERS AND SPORTS! PS: On the same topic, SD spent $458,000,000 for the Padres franchise that promised to spend money on a “competitive team”. Four years after we forked over the dough, the franchise slashed its payroll and John Moores sold his team for more than $500,000,000 after purchasing it for $84 million in 1994. This will yield him over a 500% return on investment. If the Chargers want to cut the taxpayers in on the ROI, then you have my vote! Very good writing. I am glad your posting that. I hope you can accept my apology for my less good English Skills, I am from France and English is sort of new to me. I will bookmark your blog and keep reading.